How the Hell Do I Fix My Windows/Mac/Linux Computer? If you live in the twenty-first century, you've no doubt endured the unutterable agony of a computer breaking down on you. Then comes the excruciating part: bargaining with the incapable hunk of metal to—"Please, for the love of God"—sputter back to life. 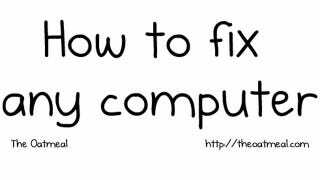 Well, the next time this happens, perhaps you can use this handy Guide to Fixing Any Computer to pick up some wisdom on the matter. Republished with permission from Matthew Inman aka "The Oatmeal," a former web designer turned comic artist. You can see more of his work on The Oatmeal. Matthew is a one man operation, so be sure to check out posters and prints from his shop or order a copy of his book.